Grazina Staneviciute, Romualda Petkeviciute, Virmantas Stunzenas, Olena Kudlai. CYSTOCERCOUS CERCARIAE IN SPHAERIID BIVALVES AND NOTES ON THE LIFE CYCLES OF PHYLLODISTOMUM UMBLAE (FABRICIUS, 1780). 6th Conference of the Scandinavian Baltic Society for Parasitology: April 23-24, 2015. Upsala, Sweden. Virmantas Stunzenas, Romualda Petkeviciute, Grazina Staneviciute. DIFFERENTIATION AND PHYLOGENETIC ANALYSIS OF GORGODERINA, GORGODERA AND PHYLLODISTOMUM SPP. BASED ON rDNA SEQUENCES WITH COMMENTS ON THEIR KARYOTYPES AND LIFE CYCLES. 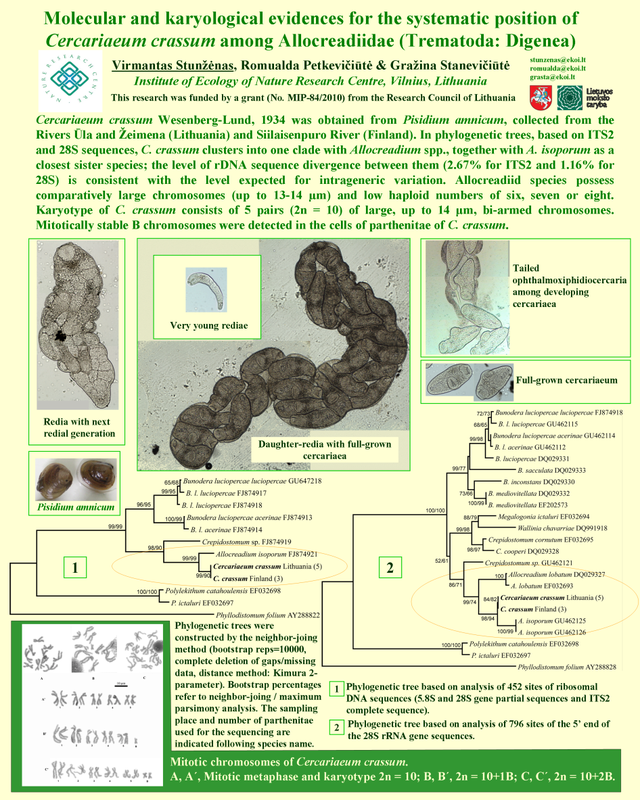 6th Conference of the Scandinavian Baltic Society for Parasitology: April 23-24, 2015. Upsala, Sweden. Petkeviciute, R., Stunzenas, V., Staneviciute, G. 2013. DNA based analysis of the life cycles of Phyllodistomum spp. (Digenea, Gorgoderidae): current status of knowledge and perspectives. Tropical Medicine & International Health. 18 (s1): 229. Staneviciute, G., Stunzenas, V., Petkeviciute, R. 2013. Studies of Rhipidocotyle fennica Gibson, Taskinen & Valtonen 1992 (Digenea: Bucephalidae), parasitising bivalvia Anodonta anatina, based on DNA sequences. Tropical Medicine & International Health. 18 (s1): 229. Kudlai, O., Stunzenas, V. 2013. First description of cercaria of Stephanoprora pseudoechinata (Olsson, 1876) (Digenea: Echinostomatidae) using morphological and molecular data. Tropical Medicine & International Health. 18 (s1): 230. Staneviciute, G., Stunzenas, V., Petkeviciute, R., Yanovich, L., Pampura, M., Garbar, O. 2013. 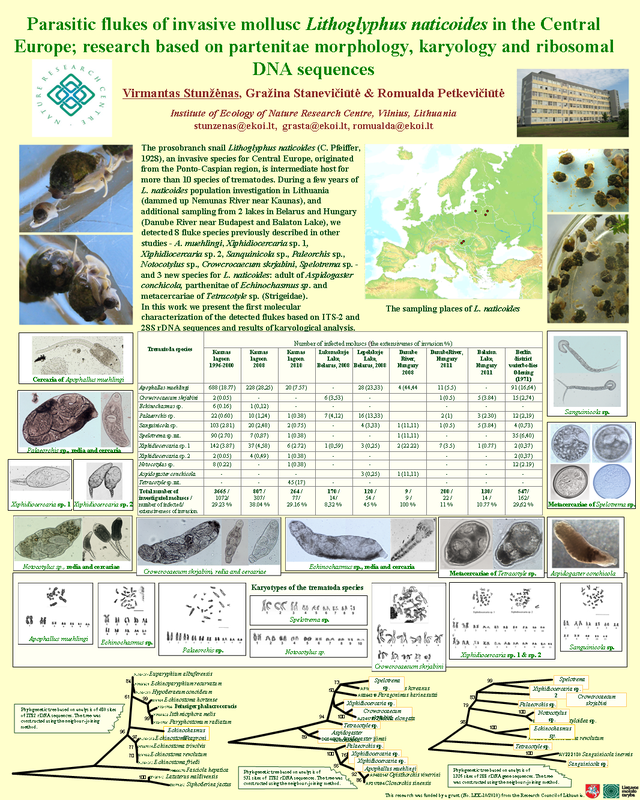 Studies of European freshwater species of Bucephalidae (Digenea) based on DNA sequences. Proceedings of XV Conference of Ukrainian Scientific Society of Parasitologists, Chernivtsi, October 15-18, 2013: abstracts: 154. Akademperiodika NAS Ukraine, Kyiv. Stunzenas, V., Petkeviciute, R., Staneviciute, G 2013. Cercaria duplicata von Baer, 1827: phylogenetic affinities based on DNA sequence comparison with notes on the life-cycles of European Phyllodistomum Braun, 1899 (Digenea). Proceedings of XV Conference of Ukrainian Scientific Society of Parasitologists, Chernivtsi, October 15-18, 2013: abstracts: 155. Akademperiodika NAS Ukraine, Kyiv.